"Bienvenue a St-Bruno," exclaimed Maxime Talbot, the hard-working forward who scored the Stanley Cup-winning goal for the Penguins on June 12. St-Bruno-de-Montarville is a suburb of Montreal, on the south bank of the St. Lawrence, and on July 31, the temporary home of the Stanley Cup. On its arrival chez Talbot, there was no doubt where it was to be placed  the designated spot had been chalked out on the front lawn! "It's like a freaking crime scene," someone said, and they all laughed heartily. Maxime took the Stanley Cup to the Centre Marcel Dulude, named to honour the town's beloved former mayor, where he staged a fundraising brunch for the Children's Wish Foundation. Joined by Iceberg, Pittsburgh's loveable mascot, Talbot hosted 400 family members and friends. The oldest guest was definitely also the most proud  Maxime's 97-year-old grandmother, Clothilde. "She was the mother of ten children," explained Maxime's brother Frank. "It was the first time all of us could make it for an event. I mean everybody! All the children and the children of the children. We are talking about more than 75 on my mother's side alone, plus 47 from the Talbot side. Then, there were another 300 friends, too!" Every single person in that room got their picture taken with Maxime and the Stanley Cup. Next, it was a trip over to City Hall and a visit with Mayor Claude Benjamin, who asked the Penguins' star to sign the town's guest book. A media conference was then held on the front steps of City Hall. Ten thousand fans were lined along rue de Montarville, St. Bruno's main street, waiting for their hero to arrive with the Stanley Cup. The procession was led by local cheerleaders, followed by a marching band. Now, you saw amazing teamwork with the Pittsburgh Penguins during the 2008-09 season, but let me tell you, it extended into July, as well. You see, teammate Kris Letang joined Talbot for the parade, and it's a good thing. Maxime had surgery on his left shoulder and was having trouble lifting the Stanley Cup. And Letang also has a bad shoulder, so it took the two friends together to hoist Lord Stanley's bowl for the fans of St. Bruno. Maxime, Kris and Iceberg rode with the Stanley Cup on a flatbed truck, waving to the fans as they progressed down the street. As the 'local boy made good,' Talbot was beaming. "It's my home town," he exclaimed. "I've lived here all my life, and my family still lives here. I played my minor hockey here. It was the only place I even bothered to think about to bring the Cup." The parade concluded at a park adjacent to Ecole de Montarville, where Maxime and his brothers went to elementary school. With Queen's 'We Are The Champions' blasting in the background, Talbot ascended the stairs to the stage. The Quebec president of the Children's Wish Foundation thanked Maxime for his generosity, and then Mayor Benjamin announced that a special plaque in Maxime's honour was going to be added to Michel Bilodeau. Representatives of the local minor hockey association presented Maxime with a special jersey that had the Montagnards' crest on the chest, the Penguins' logo on one shoulder and the Stanley Cup depicted on the other shoulder. They also told those gathered that a Maxime Talbot banner would hang in the arena during the annual Peewee hockey tournament. Maxime followed with words of great appreciation to the Town of St. Bruno and all of its residents. He had specific words of thanks to his family and for his charity. A special raffle had been held whereby tickets sold for $5 each, proceeds going to the Children's Wish Foundation. From all entries, 125 were randomly selected to meet Maxime and get a picture taken with the Stanley Cup. One of Talbot's former junior teammates, Roberto Bissonette, is an incredibly talented musician, and created a song to honour Maxime. Click here to listen. From the park, Maxime quickly changed clothes back at the family home, then took the Stanley Cup to the incredible home of Guy Laliberte, the founder of Cirque du Soleil, who lives nearby. Maxime had Stanley Cup photos taken at Laliberte's immense mansion. You will soon hear even more about Guy Laliberte, as in September 2009, Canada's first space tourist will board Soyuz TMA-16 and fly to the International Space Station. NASA has already suggested that there is no need for him to bring his stilts. Back at his parents' house, Maxime and the family could relax for a couple of hours after a hectic morning and afternoon. Sushi had been prepared, and the Talbots dipped the fresh treat in soya sauce that had been poured into the Cup. Thoroughly washed, the Stanley Cup was then filled with champagne, and the family had a sip out of the Cup as they toasted Maxime's success. There is a private island near Montreal in the St. Lawrence called Isle Charron, and that was the site of Max's Stanley Cup party. 400 of his closest friends and family, including Kris Letang and Marc-Andre Fleury, joined him for the bash, among them, the members of Simple Plan. But although that band didn't play, others did. Vilain Pinguouins opened the evening  their name, translated to English, curiously becomes 'Naughty Penguins.' Later, Less BB, Dubmatique and Shine all performed amazing sets. Roberto Bissonette again played his tribute to Maxime, then followed it with a terrific song dedicated to Chris Chelios. Although my French is poor, I was able to pick out the phrase 'man crush.' Not sure if it was taken out of context! The Stanley Cup left shortly after midnight, although the party carried on until dawn. Before the Cup left, Maxime expressed how much he had cherished the day, stating, "I hope it's not the last time we bring it to St. Bruno." Pascal Dupuis proudly displayed his newest piece of artwork. 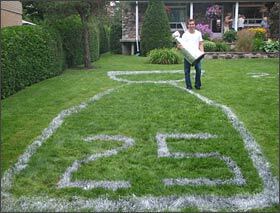 On August 1, Pascal Dupuis met the Stanley Cup in another Montreal suburb. This time, it was Blainville, about 31 miles (50 kms) northwest of the city, found at the foot of the Laurentians. Arriving at 8:30 that morning, Pascal already had a house full of guests, including his wife Carole-Lyne and kids Maeva and Kody, both of his parents with their partners and good friend Andre Roy. Seeing the Stanley Cup is always emotional to Roy, as he was engaged during his own Cup celebration. They took Lord Stanley's gift to hockey to nearby Boisbriand, where Pascal had played hockey as a youngster. There was a terrific reception there. After warming up by signing the registry, he signed autographs for another two hours, as fans from all over congregated to see the Stanley Cup and meet Dupuis. A VIP session afterwards saw Pascal meet fans and sign autographs for another 40 minutes. The entourage piled into their vehicles and made the 5-hour drive to Mont-Carmel, Carole-Lyne's hometown. The Stanley Cup was welcomed enthusiastically at the Town Hall, where Pascal signed the guest book. While there wasn't time to do an actual photo session, Pascal walked the Cup slowly along the barrier so the huge crowd of fans could touch the trophy or take a picture of it as it passed by. At the home of Pascal's in-laws, the family had pictures taken, then invited the neighbours in to spend time with the precious hockey chalice. Afterwards, they took the Shawinigan Cataractes' team bus to Pinata for a delicious Tex-Mex meal of tacos and fajitas. After dinner, the Cup was then taken to Centre Bionest de Shawinigan, the home arena of the junior club, the Cataractes. Pascal took the Stanley Cup into the dressing room for photographs, then was paraded out so that the horde of anxious fans could get pictures. At 9:30 that evening, the gang climbed back onto the bus and was ready to party. On their way to the Broadway Pub, Pascal lifted the Stanley Cup through the bus's roof hatch as they drive, and got a series of thumbs-up from passing drivers, who couldn't believe their eyes. Providing the fans one last chance to view the Cup, Pascal hoisted Lord Stanley's chalice through the roof hatch of the Shawinigan Cataractes' team bus. 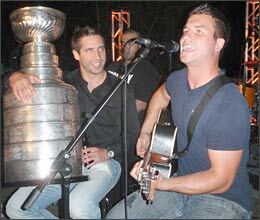 At the pub, there was a band providing the soundtrack for a Stanley Cup celebration. Pascal invited his friends to guzzle from the Cup, and then they re-created the Penguins' on-ice Stanley Cup photo right there on the dancefloor. Amazing! The night concluded sooner than anyone wanted it to, but for Pascal Dupuis, he'll work equally hard again this season so he can continue the party next summer! Our next entry in the Stanley Cup Journal pairs the goaltenders  Mathieu Garon heads off with the Cup to Quebec City, and Marc-Andre Fleury takes it into Montreal.